4th of July is always a time that is fun and festive. I love this holiday because it is stuck in the middle of summer and it is not competing with any other holiday. The 4th of July Party is like a party that can be anticipated for a couple of months. You actually can decorate for 4th of July without the feeling of a rush to get the decor down fast to redecorate for another holiday. You can relax and enjoy it. At our house, 4th of July involves, the pool, the sun (hopefully) friends hanging out, music on the Google Dot, and some really good food. 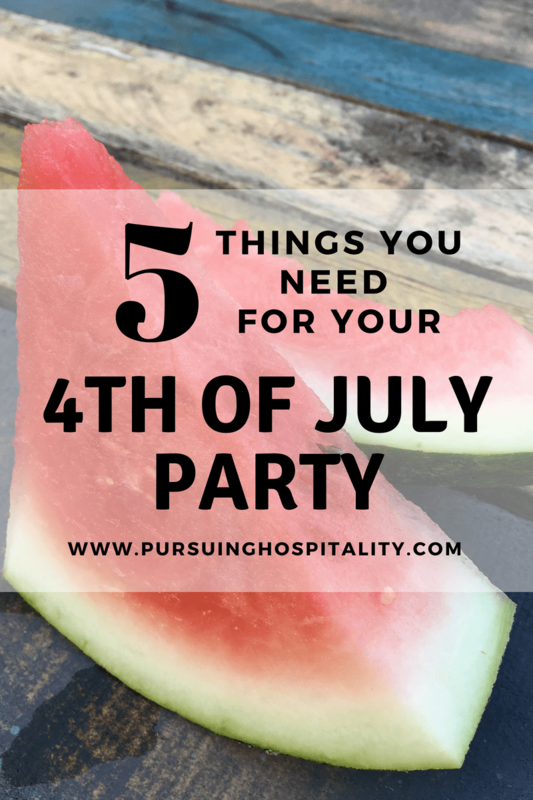 There are certain things you need to help make 4th of July special. None of these things are hard to do or even time consuming but when you take the time and effort to do them, it makes the gathering a hit. Here are some of my suggestions for your 4th of July Party. What says happy 4th of July better than an American Flag flying proudly from the front porch. It also makes people instantly get into the patriot mood when they see it. (or most people) I use to think that I could not afford an American flag. In my mind that it was expensive to have one. I am sure there are some that cost quite a bit but I found one on Amazon for less than $6. Plus Free shipping for Prime members. This one will work great and I can’t wait to hang it for our 4th of July Party. Who doesn’t love food throughout the day? Sitting by the pool, hanging out on the deck, sitting on a blanket while getting ready for the fireworks, everyone loves snacks. I have some blogging friends that are great cooks. They have shared with me some of their 4th of July Party foods. Red White & Blue Pinwheel Cookies. These scream fun! I can only imagine walking into a 4th of July Party with these on a white tray. These cookies will be snatched up quickly. Debbie at Africa’s Blog shares how to make these. I was so amazed at how easy it sounds to make. Debbie’s picture of this is above on the left. Easy Kool-Aid Pie This is probably my husband’s favorite pie. (Other than his mom’s homemade lemon pie) I love making this for him simply because it is so easy and it is light and refreshing. Donna does a great job sharing how to make this pie. Donna’s picture of this is above on the right. KISS is my motto. Keep it, simple sister. I try to keep the table coverings simple and not the piece that catches people eyes. Truly, the table coverings are simply to give the guest a clean and inviting place to sit and have dinner. If you have a beautiful table, you might just want to put a runner down the middle or placemats around at each place setting. I have a stash of Muslin Natural Cotton yardage that I keep on hand that I throw on tables. I love this because it is simple in color and you can wash it and even bleach it if needed. We purchased this on Amazon a couple of years ago for our Daughter’s wedding and I have used it over and over. Hamburgers and hotdogs are like the American food. This is the day you need to be firing up the grill. You know the Song… Baseball, hot dogs, Apple Pie & Chevrolet. Sorry to all my Friends that work at Food, it is just a song. I am a little obsessed with a new cookbook that I bought the other day. Magnolia Table by Joanna Gaines. Just for the simple fact alone, it is a beautiful book but it is packed full of recipes that are amazing and ones that everyone will eat. In this cookbook, there is a recipe for hamburgers. I wish I could share this recipe with you on here but that would be wrong. There is a little thing called copyright laws. Don’t want to break that law. This recipe is amazing. I didn’t think a Grilled Hamburger could get any better, but this one knocks it out of the park. So, I highly recommend you grab Magnolia Table and check out page 80-81 for this hamburger. Even if you don’t get the book, spend time making the burgers great. People love a good burger. That is right, you need fire. 4th of July is actually full of Fire. Fire from the grill, Fire from Candles trying to keep those pesky bugs away, and fire from the sparklers that you have stashed away for nightfall. Fire pit for roasting Marshmallows or sitting around during the evening. Sky Lanterns. This is a beautiful sight to see when you have several going at once. Candles for the tables to give your tables a glow when the sunsets. Be sure you have proper ways to extinguish the fire when you are finished. We all have to do our part to keep our communities safe.